The observant amongst us will note that we are starting out about three miles from where we stopped. The reason for this is that, after about 11 miles walking yesterday, we arrived at The Black Horse, where were to stay overnight. 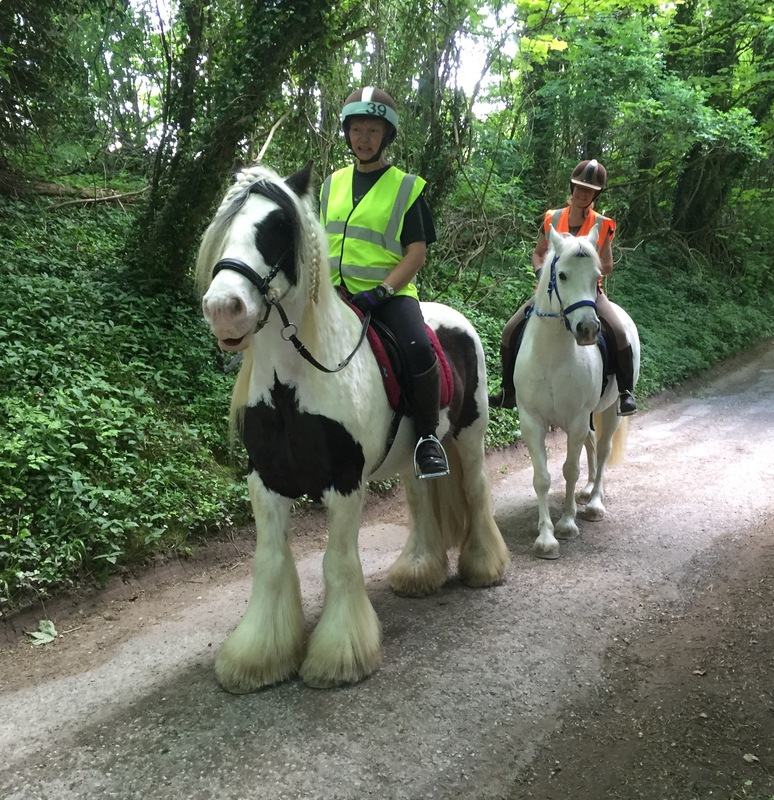 The plan of the company who arranged the walk for us was that we should walk on to Hollingborne and then be brought back and collected from the Black Horse and taken back to Hollingbourne to start the next day. We decided that that was silly, so immediately adjourned at reaching the Black Horse. However, we did not feel it was quite so daft to be carried on for another three miles to the start the day……..! For those interested in The Blister saga, I have to report that walking rather awkwardly for 11 miles to ease the discomfort, I have created another blister on the other side of my foot – great! We set out on the Pilgrims Way, yet again, fromthe Dirty Habit pub in Hollngbourne. The route at this stage was a hedge lined metalled road with views down to the right down to the A20 in the distance over the fields. The pat eventually narrowed and as we neared Harrietsham we met two beautiful horses coming the other way . Crossing the road, we continued on the Pilgrims Way. 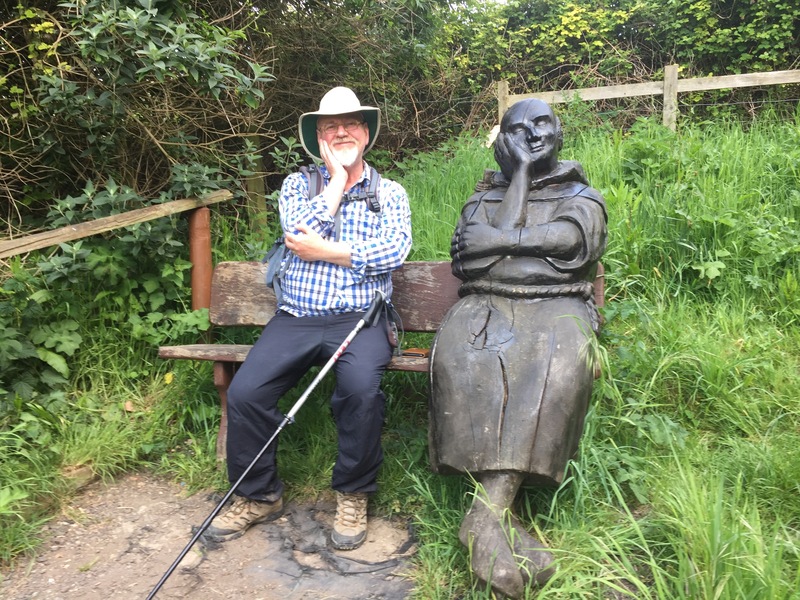 The route became tree lined and about a mile later we came across a carved wooden sculpture of a monk on a bench. The sculpture is the one on the right……. My a good picture because of the angle, but I did see the whole cross. 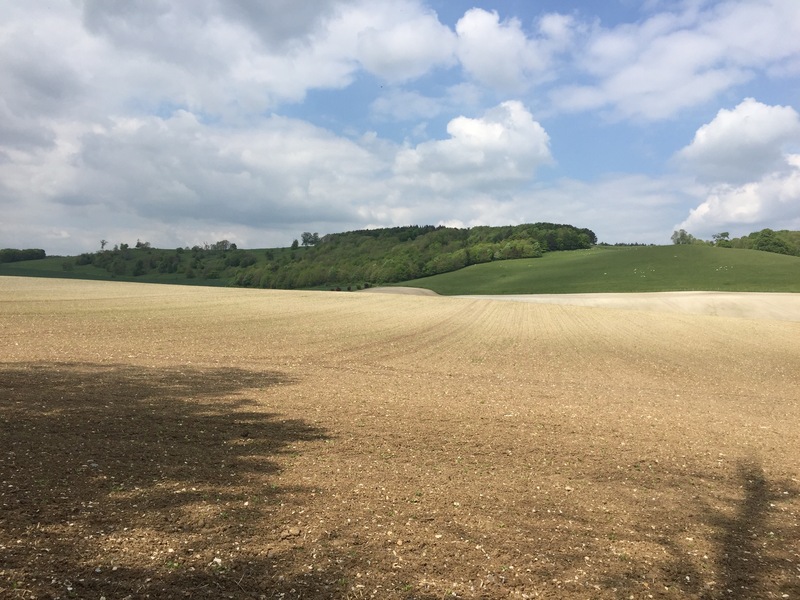 We continued in the same direction, but then came to a road leading up to a chalk quarry and we realised that we had, by continuing to follow the Pilgrims Way, lost the Downs. (Singularly careless!). On past the road, a track took us upward and we had found the downs again. We passed Highbourne Park, previously a chest hospital, and along into farmland. We wandered across fields and passed a couple of farms, and looked down on some very large farm machinery holding up the traffic on the A20. We could see Charing in the distance and eventually arrived at the top of Charing Hill. Having crossed the road, we initially walked through houses and then left these behind and after passing another quarry, we set out on a leafy path that we were to follow for several miles. Along the way an old seat appeared (Athur’s sear apparently) which we took advantage of to have our lunch stop. We had been walking for four and a half hours. It was a beautiful day and the dappled sunshine twinkled along the path. Near the end of this woodland path, it forked and we came out on a road. Here, at Dunn Street Farm, we arrived at a sign indicating that camping was available…… Now if I had carried a tent all the way from Winchester I would have been very excited at his point as it would have been the first opportunity to use it! I wonder if they get any takers? I hope they do not spend too much money on marketing to the pilgrim fraternity! We then came to the Eastwell Estate – very large and immaculate arable fields – with notices clearly stating ‘No Entry to the Public’. Quite clear. This caused sharp turns left and right to avoid offending the obvious powers that be. Here we realised that in fact the downs were now in the distance to our left. The farm buildings now came in sight. The Home Farm House looked very large and imposing in keeping with the pristine landscape. 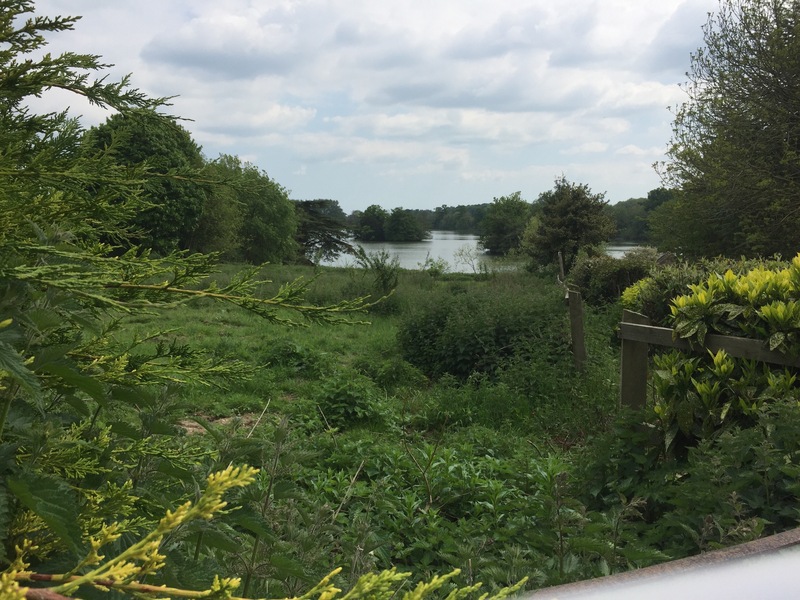 After crossing another very large field we came to the driveway to the farm house and to the right, the edge of the enormous 40 acre Eastwell Lake. Our path then took us up over a slight rise and beside a rusting water tank (tch! Seemed quite out of place!) and down through a grassy field, crossing the drive up to the Eastwell Hotel and onto the road at Boughton Lees and another technical hitch. At this point the route divides and goes ahead to Dover or Canterbury. Unfortunately we had been booked into overnight accommodation on the Dover route. This would have meant another 3 Mile walk in the wrong direction, with the requirement to walk back to Boughton Lees for the start our final days walk. It was not going to happen! We hopped in a taxi to Wye and will return to the route for our walk into Canterbury. You saw more of the white cross than the white horse and didn’t even have to go on a diversion for it! 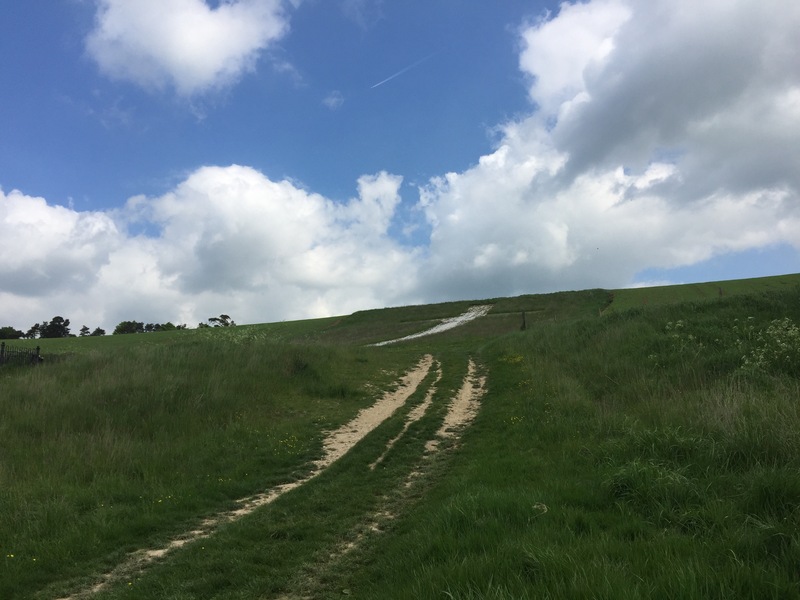 Obviously they have better quality white hillside features in Kent than in Yorkshire. I’m glad to see that the pragmatic approach to start and finish points is continuing. Away on holiday now so playing catchup with your posts.